If you are looking for an outstanding red flowering Boronia, then Jack Maguire’s Red’ is the one to find. 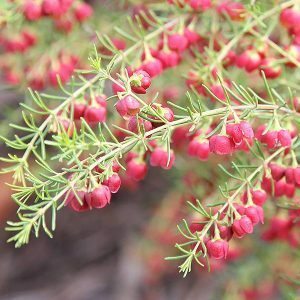 Originally named ‘Uncle Jack’s Red’, this is a chance seedling of Boronia megastigma, and it has been in cultivation since 1928. The foliage is fragrant, and this attractive plant is a real star in the garden in late winter to spring when it is in full flower. The species itself is from Western Australia, and this gives us a good indication of the best growing conditions. Like many Boronias, ‘Jack Maguire’s Red’ is not overly long lived, however with good drainage and good sun it seems to last well for us. This is also a variety that is not widely offered for sale, look in specialist Australian native plant nurseries. If you can find it, we thoroughly recommend it for those interest in native plants with impact. Position – Full sun to a little shade. Good air circulation is important. Soil – A gravelly, humus rich soil which is well drained. Height – From .3 metre to around 1 metre. Flowering period – Late winter through spring.